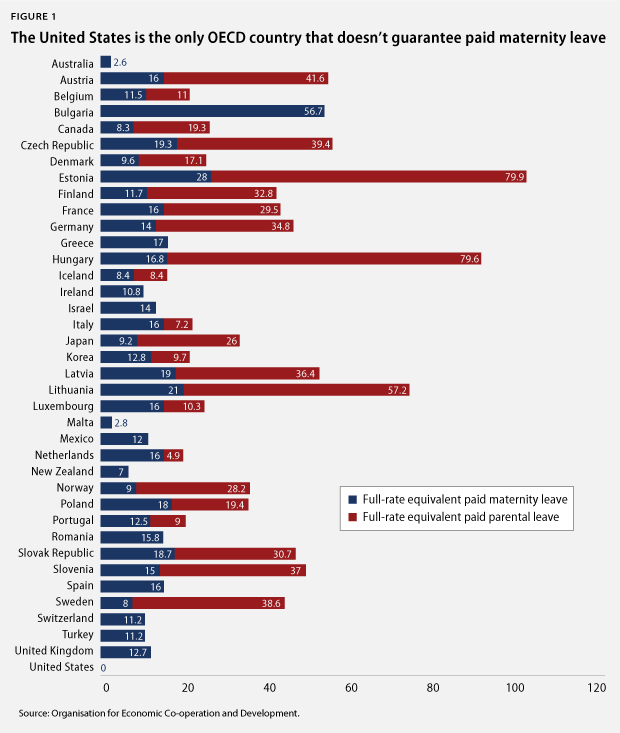 The United States remains the only member of the Organisation for Economic Co-operation and Development, or OECD, that does not guarantee mothers any paid time off from work after the birth of a new child. (see Figure 1) In fact, the United States is one of only three countries in the world—along with Liberia and Papua New Guinea—where workers do not have the right to paid maternity leave. At best, only about half of working mothers in the United States can qualify for 12 weeks of unpaid job-protected leave offered through the Family and Medical Leave Act—but any wage replacement for the time off is at the discretion of their employers. The only exceptions are for women working in California and New Jersey, which both have paid family leave insurance programs. These two statewide programs are financed by a payroll tax on workers and impose no new costs on employers. In fact, employers may save money by reducing costs associated with employee turnover, which is usually about one-fifth of an employee’s salary. Other countries recognize the many benefits of offering paid parental leave, from increased breastfeeding rates and better child health outcomes to greater paternal involvement in a child’s life when leave is offered for men. Another well-documented effect of paid maternity leave is higher maternal employment: When women have access to paid leave after the birth of a new child, they are more likely to return to work than women who do not have access to paid leave. As a result, there is a strong relationship between maternal employment and women’s access to paid maternity leave. It should not be surprising, then, that countries guaranteeing longer paid maternity leave tend to enjoy lower child poverty rates as well. (see Figure 3) This is because the majority of women must take at least some time off from work to physically recover from childbirth, and paid leave makes them more likely to return to employment after. It is also because paid leave is associated with higher maternal wages. In the United States, access to paid maternity leave makes mothers less likely to rely on public assistance after the birth of a child. It is high time that the United States recognizes the need for paid family leave and starts reaping the benefits that other countries have been enjoying for decades.